The title screen has changed to a shot of… the chapel, I think? May just be the main house. This is a surprise, that even you do not surrender. The Golden Witch has exceedingly high expectations of you. Have you perhaps come to realize the structure of this world? There can be no victory without knowing the rules. Please enjoy a hearty game with the Witch. The difficulty level is fair. Fair for you, and fair for the Witch. So I know last time I was kind of joking about writing a paper on fair play in Umineko but I was talking about it to my advisor at the start of the semester and she seemed super into it and LOOK AT THAT GODDAMN LINE “There can be no victory without knowing the rules.” R07 YOU SUNUVABITCH. We’re in someone’s head, but it’s not clear who. They refer to ‘grandfather’ so I think we’re meant to think it’s one of the kids, but I don’t think it is. I get the impression it’s one of the adults as a kid. Whoever it is is talking about a beautiful vase in the house that despite admonishment, they can’t help but touch. Sure enough, they give into their curiosity and the vase knocks over and breaks. Lightly dancing golden butterflies…were coming towards me. As mysteriously glowing golden dots shone in the air, the butterflies began to gather, one at a time. Oh, it’s Beatrice. Beatrice, that reliable Golden Witch, had arrived. She was always there for me. Whenever I was in trouble, she’d always appear and save me. So we’re far in the past, then. Beatrice points her cane at the vase and urges it to come back together. Slowly, it reforms. Oh, could this be baby Kinzo? And could our Beatrice be his daughter with this Beatrice? God that would make a lot of sense. But wait, ‘princess.’ Hmm. Later on, the narrator and Bea are in the garden, and the narrator says magic is amazing, it can fix anything. Bea says no — she isn’t powerful enough to permanently fix something. All she did was temporarily delay its fate. Sure enough, a cat jumps on the vase and breaks it. But now it’s not the narrator’s fault, so it will be okay. Bea says powerful witches can fix things permanently, and are called ‘Endless Witches.’ Their reward for power is true happiness. The narrator says she’s decided — she wants to be a witch. Bea says if she’s truly sure, Bea will start teacher her. The narrator promises she’s sure, and Bea says from now on, Bea is her teacher. The scene ends, and we cut to our Beatrice. Oh… that was Bea, wasn’t it? Poor Bea. She muses that she became an ‘Eternal Witch’ long ago. “I remember what Teacher told me. When one is released from all sadness, it is the same as eternal bliss. That’s what makes me think… that Teacher couldn’t ever have reached that level.” Eternal bliss means eternal boredom. That’s the beginning of eternal torture. ‘Training has no end. When you think you’ve reached the eternal level, that’s exactly the time to bemoan your own immaturity.’ I recalled those words as though she’d answered me directly. Bea scoffs at the idea that she has anything left to learn. Poor cynical Bea. As she muses, one of the stakes comes over, seemingly to complain about the Battler!furniture. They killed him again and want Bea to reform him. So she does. Then tease him for a while then kill him again, and again Bea reforms him. She’s endlessly entertained by torturing Battler, and wonders if this is witch bliss. So. This was a pretty short prologue. 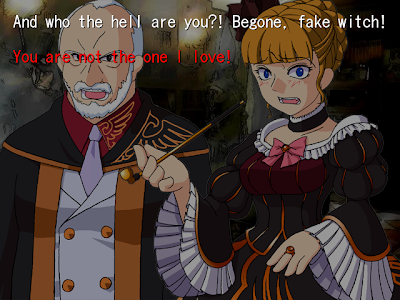 What we’ve established here, besides stuff like the existence of old!Beatrice and that our!Beatrice was a princess, is that something big happened, likely something Kinzo-related, that caused Bea to become dangerously cynical and lose her way as a witch and a person. This isn’t too surprising, since we got lots of hints in that direction last route. Her line to Battler, “…Realize this. When people are born, they don’t know of fraud. …They suffer it somewhere. And so it is learned.” is one of those great lines that I still think about a lot, like Rin’s “I laugh because if I don’t I’ll cry.” I think it’s also the key to Bea’s larger character, and hopefully this opening means we get to know more about her this route. It’s great to see you back! How are you holding up? I hope you have a great time with EP3. It’s one of the strongest episodes, imo, and for a number of different reasons I have a feeling you’ll like it a lot. Glad to hear you’re doing better! 3’s a really fun time. Next episode: The Midlife Crisis Of The Golden Witch. Hurray! More Seacats from Act. Hope you’re doing well and things are going good. 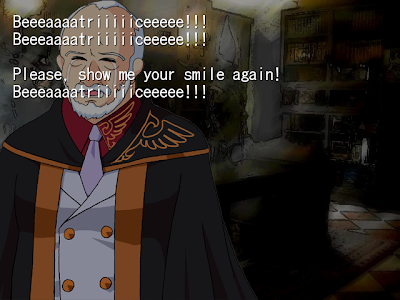 The more Umineko related stuff gets done, the better. It’s best literature ever written after all. Assuming you have any spare free time from blogging it, you should totes do a Seacats academic paper. 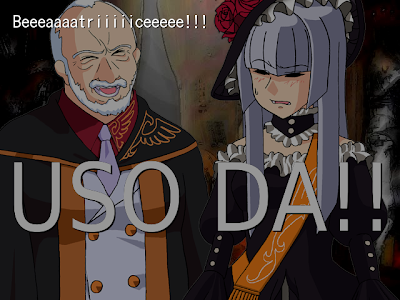 You’re certain to get the best Umineko related academic paper writer award for that, we believe in you.